Written July 6th, 2016 — Community Engagement | Community Life | Developer Updates | Events | Resident News. Marley Park does patriotic pride like no other community. Temperatures cresting to 103 degrees didn’t stop residents and guests from putting on their red, white and blue for pancakes, parade and party (say that three times fast!). Our July 2 Star-Spangled Celebration kicked off with 100 pancakes served by Boy Scout Troop #194 for a suggested minimum donation of $5 per person. 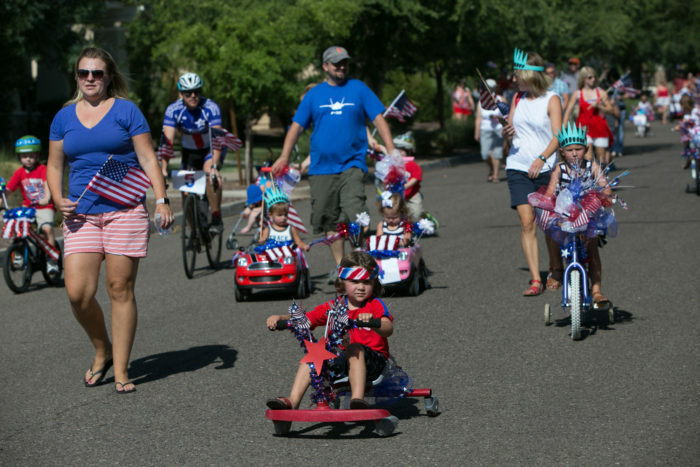 At 9 a.m., 20 festive wagons, bikes, strollers, pets and carts sandwiched between the Surprise Fire Department and Surprise Police Department paraded down 153rd Avenue to Pershing, up flag-lined Founders Park Boulevard and into the Heritage Pool House. Special thanks to Bill Adams and the 17+ volunteers that made our Patriotic Parade a success. That evening, 350 residents and guests came to the Heritage Pool House for our annual Pool Party. Fourteen volunteers cranked through registration—in just 6 minutes and 30 seconds everyone was through the line and into the cool of the pool. Attendees had lots of options to beat the heat—splashing in the pool, playing in eight tons of snow, or slipping down a two-story waterslide. Infinity Entertainment provided music and family friendly games including watermelon relay, limbo, freeze dance and balloon toss. Chad Larkin and Boy Scout Troop #194 performed the flag ceremony; Dennis Grau sang the national anthem. And it wouldn’t be a 4th of July celebration without burgers, dogs, beans and salads.